In the 1990’s, as part of re-styling traffic calming measures and the introduction of 20mph speed limits, speed-bumps were introduced in The Gallery, Silver Street, Barton Square and Road. 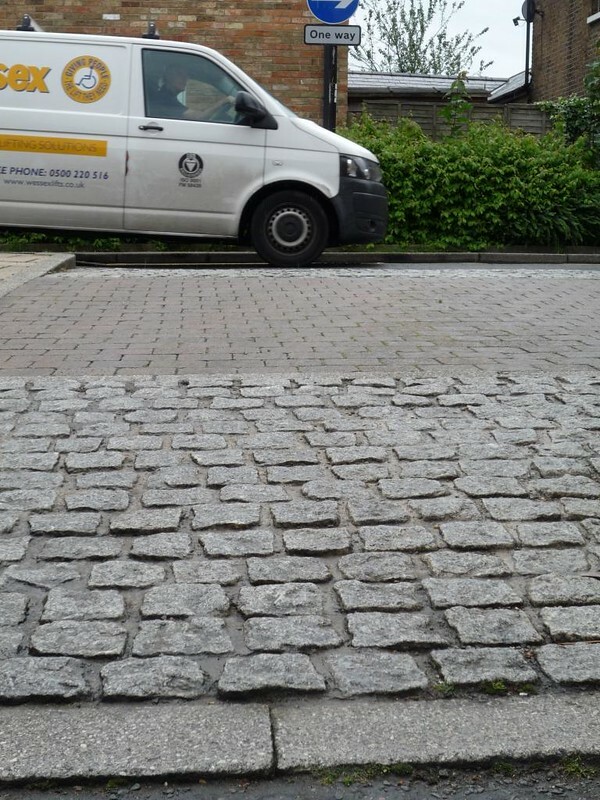 Some of the speed-bumps have closely laid smooth paving bricks, but several have the smooth bricks only on the level top part, and sharp cornered, uneven and more widely spaced ‘cobbles’ on the ramps. The heavily used, Silver street is variable width with parking bays and ‘squeeze points’ but generally narrow and many cyclists ride fast, taking the lane to avoid close passing by motor vehicles. The aggressive cobbles on the ramps to the speed-bumps are particularly uncomfortable for cyclists and numerous cases of damage to bicycles, by the speed-bumps have been noted. Smoother sections – 300-400mm wide, near the centre of the carriageway, have been suggested as a solution for cyclists. 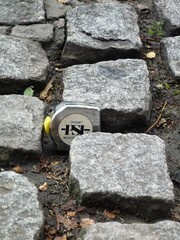 During the public consultation process, it was remarked upon that the type of cobbles would not be cycle friendly. In the early days of use of the restyled roads, letters were written to the council complaining about the speed-bumps making life difficult for cyclists and causing damage – these went unanswered. The subject has been raised on ShapeYourPlace and in local papers. The subject was also raised at the Ely Cycle Forum Meeting of 10 July 2012, where Andrea Haslock of Cambridgeshire County Council volunteered to look into the issue. My apologies for the delay in responding to your email, I have been away on leave. I have been following up on this issue and have been in discussion with colleagues in our East Highways Area Office. This is one of the many issues to be discussed at the Ely Traffic and Environment study group however whilst this group will put forward a report on which issues should be taken forward as priority, the decision will be made by East Cambridgeshire District Council members. As decisions are generally made for the following financial year to allow for necessary consultation and programming it is likely that if alterations to the cobbled humps are approved they would take place in the coming financial year rather than the current one. 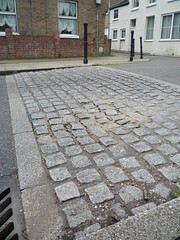 I have also looked into why they were put in as cobbled humps rather than flat top ones and am told that this was a democratically decided community requirement that gave consideration to ECDC, Ely City Council and Cathedral views on the environmental impact, owing to central Ely being a conservation area. It will therefore be necessary to consider aesthetics as well as practicality when assessing any potential redesign. This is likely to affect how we move forward should alterations be approved, as the most cost effective method may not be environmentally acceptable to the District Council. 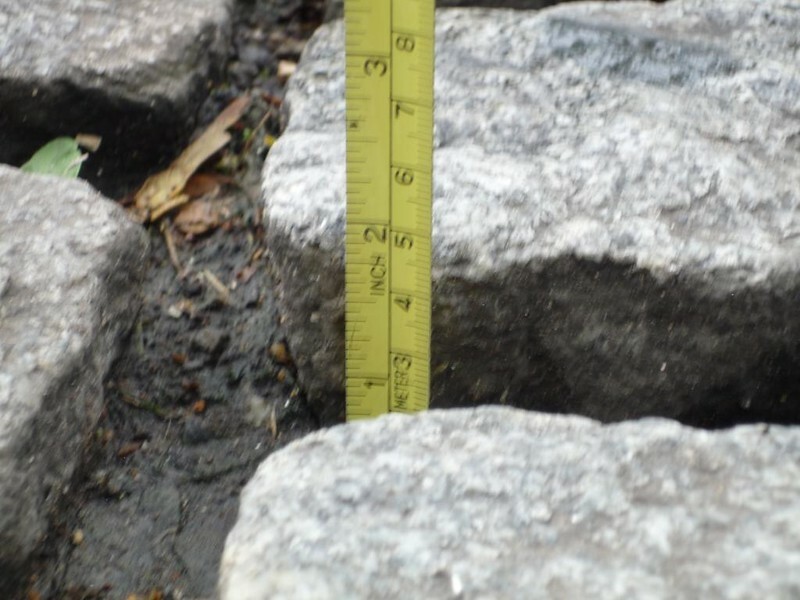 Given the number of cobbled humps in the centre of Ely it may not be possible to alter all at one time and therefore it would be necessary to prioritise and initially alter only a small number of them with a view to carrying out further works at a later date. If this is the case then I will recommend that the Ely Cycle Forum is consulted as to which locations should be selected. I have consulted with Colleagues in the Traffic team, and have been advised that their priority, from the small budget that they have available to them for this financial year, is to improve signing and lining for cyclists. Therefore any potential funding for this scheme would have to be bid for from next year’s budgets. Should no funding be forthcoming from ECDC, I will follow this up at the appropriate time with the relevant officers. The council officers all agreed they needed re-doing and the highways engineer thought the most cost effective way to tackle them was to take them up and re-lay them in a material that was durable and could be smoothed to the same smoothness as the bumps further down the Gallery. They would still need to be aesthetically pleasing to get approval but it didn’t sound like that would be an issue. The Highways Engineers will cost up the work needed to close the road, take up the setts and re-lay them so they are smooth. Jane Thomson from East Cambs Council then has the choice of whether she submits this to use the S106 money. September 25th: Andy spoke to Adam Cobb one of the highways engineers Christine spoke to on the 18th and he confirmed that the work was planned in and that highways would be happy to replace the cobbles with tarmac but the decision would need to go through the conservation officer. If they were against tarmac then flat bricks were the alternative option. Yet another wheel rim of mine (the 5th one)destroyed by these speedbumps. There are also bits of car springs often around the speedbumps. As the councils are aware of the problem do they have any liability for the damages caused, particularly if this leads to an accident involving a damaged vehicle? We have been assured on multiple occasions that the cobbles on these speed bumps will be removed and replaced with a smooth surface using some of the Sainsbury’s S106 money, yet nothing has been done. When are these dangerous cobbled speed bumps going to be dealt with? I will visit site and investigate further. I will then provide an update on my findings and any remedial works required. Steve, would it be ok for us to meet you on site and talk over the issues. Happy to join you. Let’s get something sorted here. It can be done and it’s not much to ask for and can be achieved without prejudicing pedestrian safety. July 10th: A number of campaign members had a site meeting with the County Council Infrastructure Officer. He said he could only authorise repair work but would chase up what had been previously agreed and get back to us. This is a scheme/ proposal being supported by ECDC, potentially funded by the S106 money from Sainsbury. I offered proposals to ECDC, the stumbling block seemed to be reaching design agreement with their conservation officer. A meeting was held this week between ECDC and CCC, to which I believe it was agreed that ECDC are furthering investigation/ design. As soon as this is agreed, there is no reason why the works can not be completed. However, TM will need careful consideration. 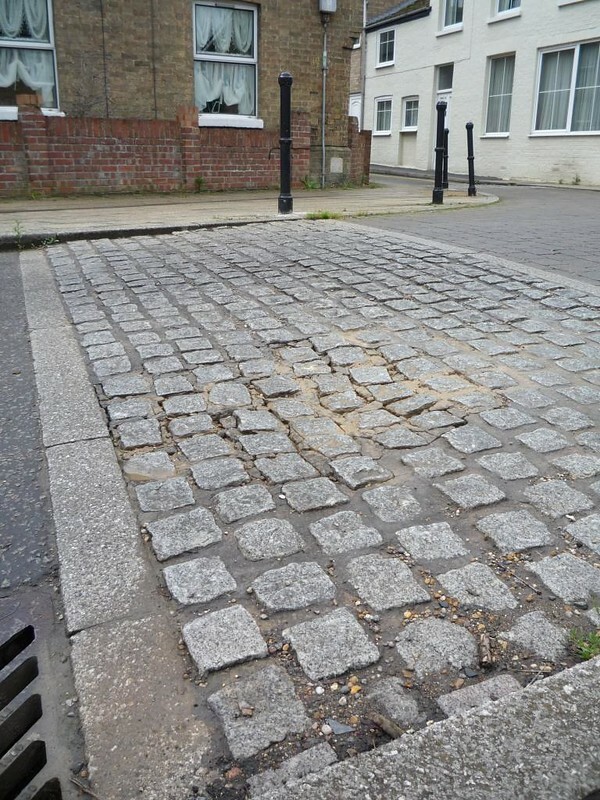 Following last weeks meeting, it has been ageed that the ECDC Conservation Team will look at a number of alternative products to replace the cobbles. Once they have provided Cambridgeshire County Council with a preferred option we will submit a price too carry out the works at which point ECDC will decide the best way forward. The cobbles on the bump on Barton Road adjacent to King’s School are especially bad so would hope to see this hump high up on the priority list. Those on the other hump further up Barton road aren’t much better. To save costs it wouldn’t even be necessary to smooth the entire width of the hump, all that is really required is some smooth strips on each side of the road nearest the pavement where people generally cycle (on this road at least). Yes, I agree. Just would like to add to not forget people with bicycle trailers. One thus needs at least a 1.2? m wide section flattened – on both sides in Barton Road, and on 1 side in Silver Street. this might also be an acceptible compromise for the conservation officer, who might perhaps not like the tarmac idea. triple win: conservation ok; lower costs; cyclists happy. Personally, I would prefer this over a full tarmacking over. Living bang on Silver Street, I am consciously aware of every driver who speeds through this street. Although replacing cobbles with tarmac would probably not make any difference for car drivers, visually it will have a very different impact and car drivers are more likely to take these humps at higher speeds. Keeping the central zone with cobbles means keeping the same visual ‘difficulty’ for car drivers. 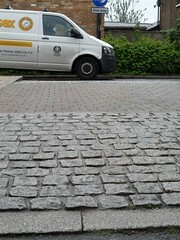 As cyclists we would not want to remove one problem (bad cobbles) with another (more speeding car drivers up our backs).